Our UTFC range of universal tube furnaces can be used in a vertical or horizontal position and have three separate heating zones to ensure good uniformity across the work piece. They are often used by laboratories for tensile testing of materials, as creep-test furnaces or stress rupture test furnaces. In most cases they are suitable for replacing units of other makes, such as Mayes, Dennison, etc. On the side of the casing is a terminal box for connecting to the elements and earthing the unit. 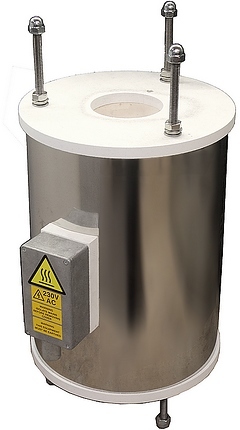 Most models have a small tube for a thermocouple embedded in the heating elements for over-temperature protection (which when used with the proper equipment ensures the elements don't over-heat). Therefore the units can last much longer and are less likely to fail during a test. The units have either three or four M10 threaded mounted rods on a PCD of 203mm ±3mm. There is a choice of 4 standard models, these include 3 tube diameters and 3 lengths. Control systems are sold separately, please see the datasheet below or contact us for more details. Appearance will vary depending on model. UTFC1 shown. We can also manufacture new units to customers' specifcations, please contact us for more details. The MetTest2 control unit provides precise and stable temperature control of 3 furnace zones. It is an ideal companion to a creep test furnace from our UTFC range. 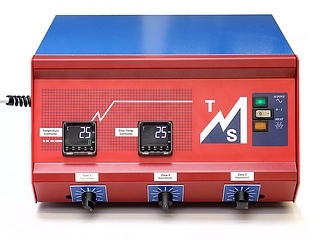 The MetTest2OTP also incorporates a separate digital controller providing independent over-temperature protection, which can be set by the user. This is recommended for systems that will be left unattended, in order to help comply with Health and Safety legislation and insurer's requirements. Standard size thermocouple sockets on the rear can take a Type K, Type N or Type R thermocouple input for the main controller (configured for N by default) and a standard size Type N thermocouple socket is provided for the over-temp (MetTest2OTP). A connection terminal box at the rear is provided for connecting 3 zones of the furnace (6 terminals). Thermocouple sensors and furnace connection cable assemblies are ordered separately. Zone Controls: All 3 zones have manual power turn-down as a percentage of the centre zone's output. Output Method: Time proportioned Solid State Relay. Protection Method (MetTest2): Contactor controlled by main controller to protect against SSR failing on. Protection Method (MetTest2OTP): Separate digital controller providing independent over-temperature protection. Over-current protection: Fuse for each zone and MCB circuit breaker at rear.